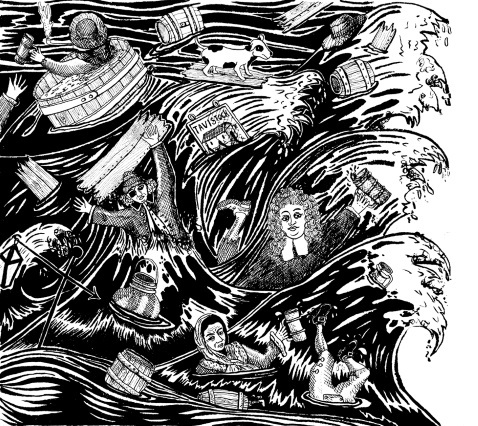 The London Beer Flood happened on 17 October 1814 in the parish of St. Giles, London, England. 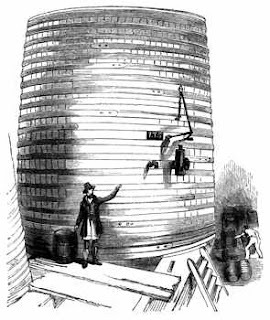 At the Meux and Company Brewery on Tottenham Court Road, a huge vat containing over 135,000 imperial gallons (610,000 L) of beer ruptured, causing other vats in the same building to succumb in a domino effect. As a result, more than 323,000 imperial gallons (1,470,000 L) of beer burst out and gushed into the streets. The wave of beer destroyed two homes and crumbled the wall of the Tavistock Arms Pub, trapping teenage employee Eleanor Cooper under the rubble. Within minutes neighboring George Street and New Street were swamped with alcohol, killing a mother and daughter who were taking tea, and surging through a room of people gathered for a wake.